Bread, dosh, dough. Whatever name you give it, it is hard to define our relationship with money. 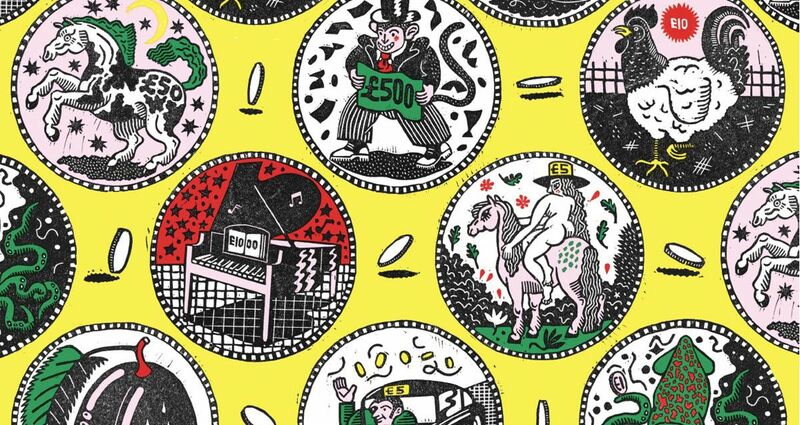 As the new 12-sided £1 coin enters circulation, the V&A delves into your wallet to trace the history of money, the challenge of counterfeit and attempts at alternative economies. Highlights of the event include a display and talk by the Royal Mint which will track the history, design and production of the new pound coin. Artist duo They Are Here will present an interactive installation ‘Tantalus’, inspired by the Ancient Greek myth, which invites visitors to approach a £5 note suspended on a golden thread which is ultimately out of reach, representing the strain of unattainable desire. Dr Emma Newport will take a look at how and why women have been depicted on money. From Britannia to Fry to Austen, this talk will question money's uncomfortable relationship with figureheads and femininity. Brixton Pound will take over the fashion gallery with a talk and workshop exploring community currencies and questioning what are where we place value. Visit the V&A on Friday 31 March from 18.30 – 22.00 for the original free contemporary late night event and explore the curated programme of live performances, workshops, installations, talks, films and DJs, with bars, food, and late-night exhibition openings. From the jawline of Kim Il Sung to the curls of Queen Elizabeth, artist Philippe Pétremant transforms bank notes into absurdist portraits using origami folds. Piece together the global figureheads that feature in this photo series of portraits, created from currencies around the world. Purveyor of all things fun, Dan is never afraid to use the lowest common denominator to get the crowd moving. From nostalgic House, Disco to Grime and 90s Hip Hop, dance the night away with the former pirate radio DJ as he spins a special playlist all about cash. In Greek mythology Tantalus was damned to eternal punishment, standing in a pool of water beneath a fruit tree with low branches, but with the fruit and water ever eluding his grasp. Tonight money will hang from a golden thread, but as you approach the note is raised out of reach. In November 2016 India’s Prime Minister announced that all 500 and 1,000 rupee notes, accounting for 86% of the currency in circulation, would cease to become legal tender. Simultaneously a new 2,000 rupee note was introduced provoking mixed reactions amongst the Indian population. Using this new note as a springboard for discussion, create your own currency with V&A Research Assistant Zara Arshad. Explore how currencies are designed and discover the meanings we create through their colour, symbols and patterns. Lay back on a pile of giant coins and absorb yourself in the invisible flow of money. Overhead a short film asks you to consider the virtual territories of currency by taking you on a fieldtrip to the trading floors of Canary Wharf investment bank J.P.Morgan. Do you know your commodity from your commerce? Can you tell the difference between risk aversion and behavioural economics? Apply your knowledge and imagination to a piggy bank of economic terms, helping The Alternative School of Economics to build a collection of common understandings of money speak. Discover the covert financial propaganda that lurks in every pocket, as the Brixton Pound comes into circulation at the V&A. For one night only, exchange your sterling for this alternative currency to buy yourself a drink at the bar. Join the debate as we explore money’s place in a fairer world, or pick up a Brixtopian Manifesto to find out more about building an alternate currency and nation-state. Want to join the revolution? Then customise your clothes with messages of positive financial resistance together with fashion activists #BodyPolitic. As the new £1 rolls into circulation join the Royal Mint Museum to discover the history of the denomination, whilst uncovering the significance behind the coin’s varying designs and inscriptions. Throughout the night you can come see the new 12-sided £1 coin and follow its design process, from counterfeit prevention through to production. This musical sculpture invites you to step into the world of the Walden Two, a utopian novel by behavioural psychologist B. F. Skinner. Building on Skinner’s ideas, this futuristic musical payment machine emits melodious noises, which denote the destruction of money that occurs during each of its transactions. Come listen to its dissonant chords as it churns out an ever-changing pattern of notes and hums. As the world moves toward digital currency and virtual transactions, our tangible understanding of money and its value is becoming lost. Join designer Gadi Amit as he talks to V&A curator Johanna Agerman Ross and showcases his conceptual currency Scrip. Scrip is a tactile payment device for digital transactions that attempts to reintroduce the values of fiscal responsibility and mindful consumption to the digital age. Join Dr Emma Newport to question money's uncomfortable relationship with figureheads and femininity. This talk asks why mints depict people and symbols on coins and paper money? What do we mean when we talk about value and worth? Please note coats and bags are not permitted in the Library. Please leave these items in the cloakroom. A depiction of Jane Austen will shortly embellish the new £10 note. Explore a small display of Austen novels from the National Art Library, exploring the role of design and illustration in the selling of books. It need not cost an arm and a leg to become a museum donor. Have you considered ‘physical philanthropy’? Instead of your name on the wall, your likeness becomes part of our exclusive V&A shadow gallery. Visit the 3D Scanning Department, to see if you have the necessary capital to donate pieces of yourself to our ever-growing collection. Drawing inspiration from the V&A collection, build a new artefact to fool the experts. Whether it’s a golden crown, bejewelled brooch or ancient masterpiece, take your object to the valuation station and try to pull the wool over the eyes of our highly trained experts. If successful you'll receive a certificate of authentication and the offer to cash in your counterfeit. Come peruse our non-linear timeline as it takes us around the world to uncover just what the cost of economic equality is for women. Track the shifting tides in regulation and social norms, to explore women's historically oppressive relationship with money.